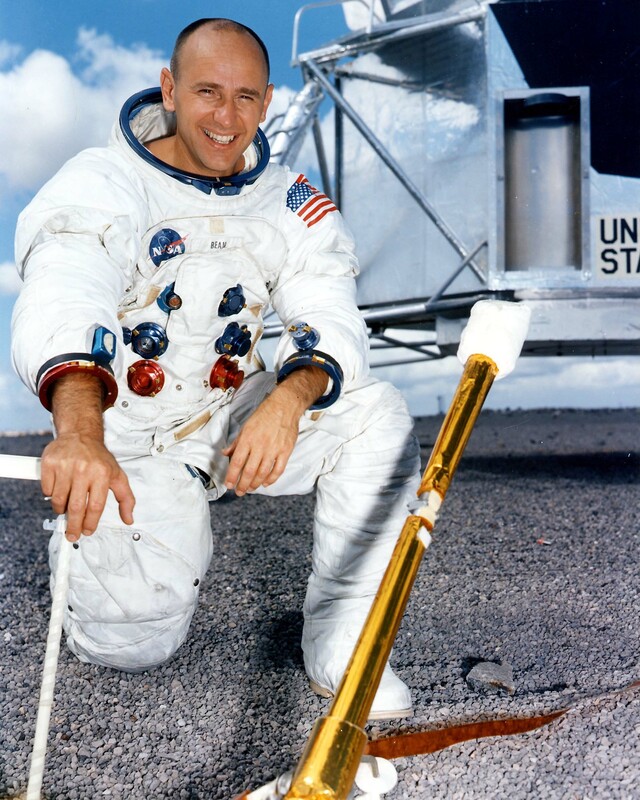 Alan Bean was born in Wheeler, Texas, in 1932. He graduated from high school in Ft. Worth in 1950 where in his last year he was selected for a NROTC Scholarship at the University of Texas at Austin. Five years later he was awarded a Bachelor of Science degree and was commissioned Ensign, United States Navy. In 1956 he completed flight training and was awarded Naval Aviator wings. He was assigned to Jet Attack Squadron 44 in Jacksonville, Florida. Four years later he was selected for The Naval Test Pilot School in Patuxent River, Maryland. When his schooling was completed, Alan was assigned to the Service Test Division. Alan spent three exciting years as a test pilot, flying almost every type of plane in Navy service. It was here, flying almost every type of plane in Navy service, that his latent interest in art strengthened and he enrolled in night classes in drawing and watercolor at nearby St. Mary’s College. Alan was testing high performance airplanes in the day time, and drawing and painting nights and weekends. In 1963 Alan was selected as an Astronaut for the National Aeronautics and Space Administration. He was the Lunar Module Pilot on Apollo 12, man’s second Lunar Landing. Alan became the fourth man to set foot on the moon. In 1973 Alan again flew in space as Commander of Skylab Mission II. This mission lasted 59 days and traveled 24,400,000 miles. His crew accomplished 150% of their pre-mission goals, a record unequaled, even today. After Skylab, Alan was selected as backup spacecraft commander for the joint American-Russian Apollo-Soyuz Test Project in 1975. Alan then served as Chief of Operations and Training and Acting Chief Astronaut until the first flight of the space shuttle. Throughout Alan’s career as an astronaut, when not in specific mission training, Alan took courses at the Houston Museum of Fine Arts, Glassell School Of Art and from a number of talented fine artists in the Houston, Texas area, at night and on the weekends. They were right on. Although Alan was training to command an early space shuttle mission he realized that there were young men and women there that could fly those as well or better than he could, but he was the only one of the 12 humans that walked on the moon, that was able to celebrate the great adventure that was Apollo in fine art. 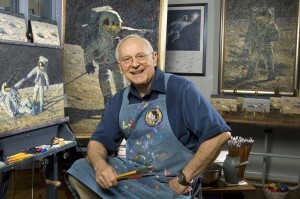 So, in 1981, Alan Bean resigned as a NASA astronaut to devote his full time and energy to painting. While at NASA, Alan helped establish eleven world records in spaced and astronautics. He was awarded two NASA Distinguished Service Medals and two Navy Distinguished Service Medals. He has received the Robert J. Collier Trophy, Yuri Gagarin Gold Medal and numerous other National and Internationals honors. He is listed in all major Who’s Who. He has been on the cover of Time and Life magazines, appeared on many television talk shows, and was the subject of a prime time program on the Public Broadcast System. Alan has flown twenty-seven types of military aircraft as well as many civilian airplanes and has logged 7,145 hours of flight time. For the last 28 years, Alan has been a full time professional artist. The transition has not been without a lot of thought and effort. Alan vowed when he resigned from NASA, “I will not be an astronaut that paints, but will become an Artist that used to be an astronaut.” And so he has, continuing his art education at The Museum of Fine Arts Glassell School, private study with talented professional artists in Houston, and in a variety of selected painting workshops throughout the US. Over the years his work has evolved into a mixture of painting and sculpture, textured with lunar tools, sprinkled with bits of his Apollo 12 spacecraft, and the emblems and flag from the spacesuit he wore on the moon. These emblems, awarded to me by NASA, even today remain dusted with a touch of moondust from the Ocean of Storms. Alan has had a number of exhibitions during his long career, the most recent at The Butler Museum of American Art, in Youngstown, Ohio. At that show he was awarded the prestigious Butler Gold Medal For Life Achievement in Art. Alan Bean has a magnificent obsession, “I want to record, in fine art, paintings that will tell future generations of humankind’s first exploration of another world. We are at a pivotal point in history as we move off this planet. It’s going to take a while, and it may be decades until other artists gaze across the surface of the Moon and lift their eyes up toward the distant Earth, that blue marble in the sky, but that day will come. It may be a lifetime or more before the first artist walks on the Red Planet and worlds beyond, but this, too, shall come to pass. The body and nature of paintings from other worlds will grow beyond our ability to imagine, but these paintings Alan Bean is creating now, will forever be the very first.